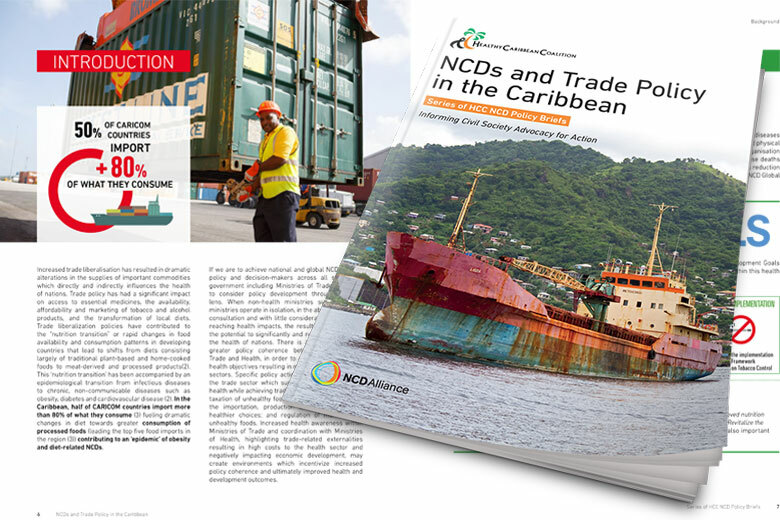 This HCC NCD Policy Brief ‘NCDs and Trade Policy in the Caribbean‘ highlights the interactions and relationships between trade and NCDs and the role of trade policy actions in support of the prevention and control of this group of diseases in the Caribbean. The brief provides information and case studies on the interconnection and relevance of trade to NCD prevention and control and outlines linkages between trade policies and specific NCD risk factors, specifically tobacco and alcohol use and unhealthy diets. It closes with recommendations for priority policy actions, which can be used as a starting point for civil society led advocacy. The brief, developed with the support of the NCD Alliance, is one of a series that builds a case for NCD policy action across non-health, health-influencing government sectors in the Caribbean, and is part of the HCC’s ongoing NCD advocacy agenda. It is first and foremost an advocacy tool for Caribbean civil society organisations (CSOs) to inform their advocacy efforts aimed at triggering the development and implementation of trade policies which support a reduction in the burden of NCDs. It is hoped that CSOs will gain a greater understanding of key trade and NCD-related issues and policy options leading to more strategic and effective advocacy. 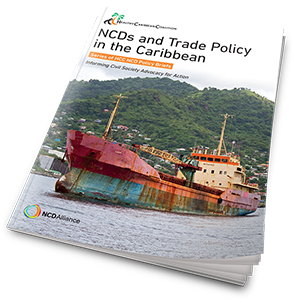 Read/download the NCDs and Trade Policy in the Caribbean Policy Brief here.